Book in Advance and Save 15%... on all on-site classes from July - December 31, 2019! This special offer applies to every on-site class that you schedule prior to June 1, 2019, with the class occurring any time before December 31, 2019. Get out your calendar and plan your training for the year because you're about to save big! Contact David to get started. Check out the Spring 2011 line-up of public classes in Stockton, CA, or schedule a class at your own office for flat-rate pricing. After you've learned the essential features of PowerPoint, take your slide design skills to the next level and master the use of font, paragraph, and shape formatting. We'll cover how to control and customize text bullets, alter margins and line spacing, and all kinds of other features that will help you fine-tune your slides for maximum impact. Slides don't have to be static! Learn how to include animation, transitions, music, and video in your slides to make them more informative and interesting. Make your next presentation shine after learning how to best offer data (charts and tables) to your audience with ease. This hands-on class will have you creating, editing, and formatting charts and tables within PowerPoint. Other topics include the best practices when copying and pasting from Excel, adding annotations (text, arrows, circles, etc.) and animating them, and techniques on keeping it simple. Not everyone does great in front of an audience, but this class can help. 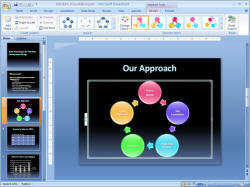 Attendees will learn everything they need to deliver a great slideshow in front of an audience using PowerPoint's delivery features. We'll cover Presenter Mode (which is like a cheat-sheet for speakers), online delivery tips, the use of remote controls, special keystrokes, and other technical tips and best practices. We'll also review Public Speaking 101 and talk about what makes an effective delivery, touching on confidence, audience participation, goal-setting, and more. This crash-course in PowerPoint is designed for everyone who's used the program but never had formal training. You'll learn the tricks, the best-practices, and a few hidden features that make creating slideshows easy. We'll specifically cover the use of the your official company template and its variety of design layout options and they can be used to create a great-looking presentation with ease.